Summary: Even after decades of study, much remains unknown about green turtle life history. In Florida, small to mid-sized green turtles are abundant in nearshore waters while the largest immature animals between 70 cm and 90 cm are rarely seen. Adult green turtles are found foraging in the lower Florida Keys (Schroeder et al., 1996). Recently our group made an extraordinary discovery in an area west of the Marquesas Keys in Florida. 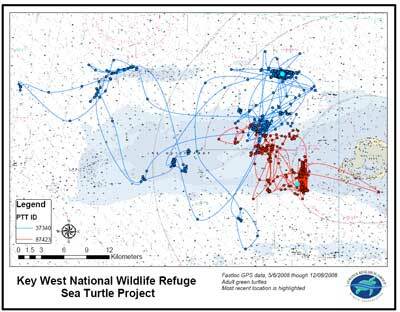 We have identified, for the first time in the United States, a large foraging area shared by large subadult and adult green turtles. Using Fast-GPS satellite technology and sonic tags we intend to follow the local movements of these immature and adult green turtles to better understand home range and habitat use. If immature turtles migrate to other waters, we will learn their routes and destinations. Should the adults migrate to the nesting beach, we will learn which beaches. To the best of our knowledge, no one has tracked adult green turtles from foraging grounds to the nesting beach. The information gained from this study should allow managers to make important conservation and management decisions for this endangered species, and provide us with greater insight into the life history of green turtles.